A cyclonic circulation lies over Gulf of Siam and neighbourhood and extends up to 3.1 Kilometers above mean sea level. Under its influence, a low-pressure area is likely to develop over North Andaman sea during next 24 hours. Models are hinting a south-west dip once it enters Bay of Bengal waters and moving towards Tamil Nadu/Sri Lanka coast as a weak system. Meanwhile, Isolated rainfall is expected to continue in few parts of interiors and coastal TN owing to weak easterlies hitting TN coast. A gradual increase in rainfall can be expected from now on. 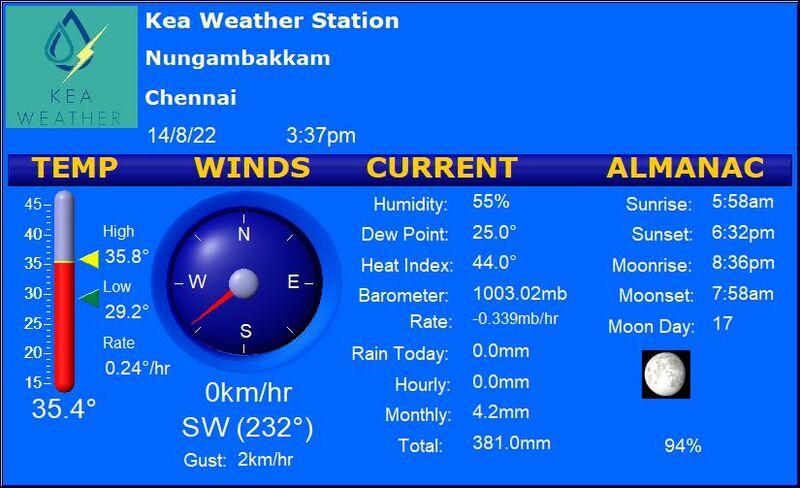 Chennai – Partly Cloudy, pleasant condition with Max Temp of 31 °C; A passing shower expected. Vellore – Mostly cloudy condition with Max Temp of 31°C. Light rain expected today. Madurai – Mostly Sunny and less humid. Max temp would be around 32°C. The region may witness some thunderstorm. Trichy – Partly cloudy. Max Temperature would be around 33°C. Afternoon shower expected. Coimbatore – Partly cloudy & pleasant. Max Temperature would be around 31°C. Rain expected in the city. Orathanadu in Thanjavur district recorded 1280 mm from Cyclone Nisha in 2008 making it the wettest NEM cyclone for Tamil Nadu.